Hello and welcome! Today's post is for the latest challenge over on the Frilly and Funkie Blog. The theme is Surf's Up and today is the last day to enter, nothing like waiting until the last minute. 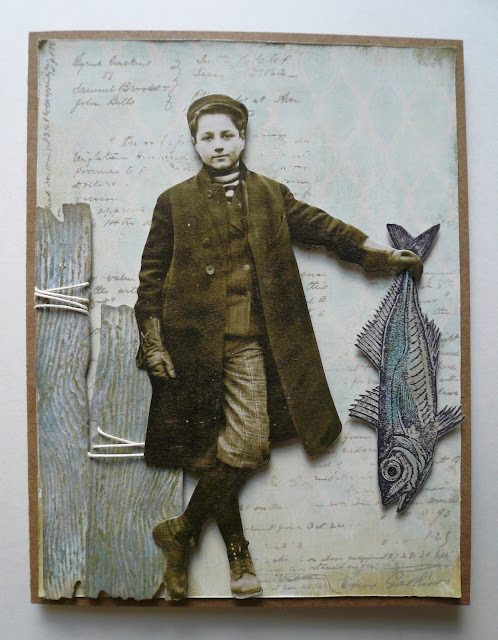 For my entry I created a card with a young man, from the newest pack of Paper Dolls, standing on a dock showing off his catch after a day of fishing. To make the dock pilings I used the Planks Die, Woodgrain Cardstock, Distress Inks and Craft Thread. I can't take credit for this design idea, I saw a card that Pete Hughes created on the Sizzix UK Blog recently. The fish is from the Sea Life Stamp Set. I stamped it on a piece of patterned paper, cut it out and then colored it with Distress Inks. For the background I used a piece of patterned paper from the Menagerie Paper Stash that I white washed with Distress Paint and then stamped the script from the Entomology Stamp Set. To finish I attached it all to a kraft card base. I really like how this card turned out and think it would be perfect to congratulate someone or for Father's Day. Thanks for stopping by! I love this, Deb! It's so perfectly vintage and wonderfully whimsical! Thanks so much for sharing with us at the Frilly and Funkie "Surf's Up!" Challenge! Very fun image and love that you added the fish! Cool dock pilings! Great card for father's day or someone who love to fish! Thanks for playing along with us in the Frilly and Funkie Challenge "surfs up"!